Credit: By Esther Vargas on Flickr. Some rights reserved. 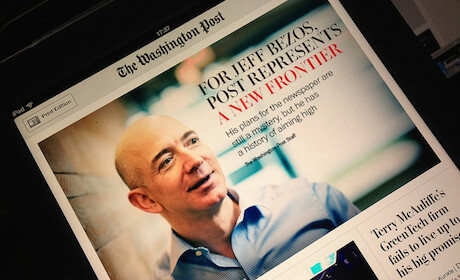 Since Amazon co-founder and chief executive Jeff Bezos acquired The Washington Post in 2013, the 139 year-old outlet has made efforts to put technology at the core of its business. In recent years, it has changed from a “content company into a product company”, the Post’s director of product Julia Beizer told the audience at the Digital Media Strategies event in London today. At The Post, the process of building a new product in the newsroom is divided into five key steps, she explained. “Our biggest competitors these days aren’t The New York Times or CNN. They are Hulu, Netflix and any place a user might spend their time,” Beizer said. After purchasing The Post, Bezos challenged the team to develop a new product to capture a “new national audience”. The initiative came to be known as Project Rainbow and the app first launched on Kindle Fire in November 2014 before it was rolled out on iOS, Android and Apple Watch. Looking at the data, the team discovered The Post’s audience who was coming to it for its politics coverage had a wider interest. “The first thing we did was to think about how we could balance that type of coverage with news from a broader circle,” said Beizer. The design of The Post’s new app was inspired by a rising social media trend at the time, using a card format the team calls Brights. These were created by a team of designers who were brought over from the print side, which “helped the work resonate”. In 2013, the outlet updated its suite of apps with Post Classic, a subscription-based replica of the print product available in PDF format on mobile devices. When people started complaining that it took too long to download, the team set off to update the app in an attempt to make it load faster. “Product development helps narrow your focus – what exactly are you hoping to achieve with a piece of software? After deciding on the latter, the product was revamped to preload the first two pages of the newspaper when the reader clicked on an issue. This gave people the impression that stories were loading instantly, while the app worked in background to make the rest of the content available as the user scrolled through. The Post’s app built under Project Rainbow was extended to desktop and mobile web browsers in 2015, to “try and share the mobile and social audience,” said Beizer. One of the features introduced was a preview of the next story within the article a reader had landed on. The team conducted 10 tests over a period of four months, seeing a 22 per cent growth in engagement per page. be bold: “dramatic tests produce quicker and more actionable results, and we have to be creative about the experiences we choose to take on”. The Post is betting big on distributed platforms – it was among the first news outlets to “go all in” on Facebook Instant Articles and one of the publishers who adopted Google’s new Accelerated Mobile Pages initiative. “If these platforms create better experiences for our users, people are going to be there and we want to be there too,” said Beizer. To measure its success on Instant Articles, The Post started looking at one metric in particular: visits per visitor. “Do people come back more often when they see the reading experience can be better? “We saw that a significant amount of users returned more often within seven days,” Beizer said. Beizer gave Bandito as an example – a new tool developed in-house to automate headline testing and article optimisation in the newsroom. Bandito allows Post editors and journalists to create multiple variations of the same story before it is published, alternating elements such as the headline or the main image, which can significantly determine whether a reader clicks on the article or not. The tool then pushes out all versions of the story and after monitoring performance, it automatically offers people the option that has performed better. The Post has already seen up to a four per cent increase in the click-through rate on certain stories optimised with the tool and it plans to expand its use to other verticals, Beizer said. “It helps us measure when our work resonates with readers, but at the moment it's limited only to people who come to our homepage. “It’s something we will definitely double down on, as we look for ways to bring it to social and distributed platforms,” she added.